Eee manufacturer Asus has expanded its sub-notebook series with a desktop version. The Eee Box with the Intel Atom processor is available in Linux and Windows XP. 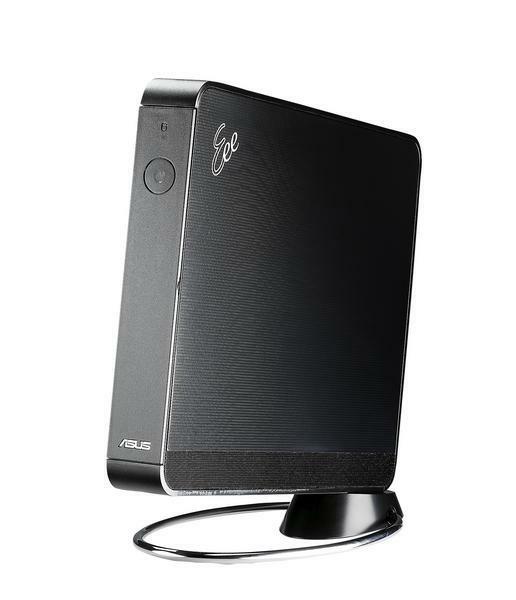 The enclosure, at 8.5" x 7" x 1", is reminiscent of a thin client; Asus calls its mini desktop a "one-liter device." The Eee Box B202, with an Intel Atom N270 CPU at 1.6 GHz, is available at around $300 for the Windows XP version with 1 GByte RAM and an 80-Gbyte hard drive. The Linux/Easy OS version, for about the same price, has twice the power at 2 Gbyte RAM and a 160-Gbyte drive. The box weighs 6.6 lbs, comes in black or white, and can be placed on a small stand or tucked behind the monitor. An Intel 945GSE graphics chipset is inside. The device is specified to emit no more than 26 db and comes with 65-Watt power adapter. Eee Box B202 -- extra RAM for Linux users. Networking is over WLAN 802.11b/g/n and Gigabit Ethernet. Front ports include two USBs and a card reader for countless external formats. Rear ports include a digital video interface, analog and S/PIDF audio line-out, and another two USBs. Keyboard and mouse are optional. The device is available since July in the US, the European market has to wait until October. PC maker Dell has announced the Inspiron Mini 10 netbook that runs on the new Intel Atom CPU. Hardware provider Hewlett-Packard has released a Linux version for its mini-laptop. HP wants to be clear from the outset that disabling the Linux command line interface in the product is not an act of heresy. Asus is taking pre-orders for a new netbook that runs on the combined Atom N280/GN40 chipset. Maybe you strictly-Linux users have to wait longer. Don't know where you got this info, but Aus shows no such product on their web site nor do any of the retailers shown on the Asus site have this product. Looks like just another rumor. If the stores offer only the Windows version, I'd get on their nerves and ask for the Linux version. That's one way to get Linux into their minds, so they'll realize that there are people out there who'd like to have choice. Here we go again. ASUS could cut their inventory of parts, streamlining operations, by using the same configuration for XP as GNU/Linux but they went out of their way to help their buddy hide the price of the OS. Where can you buy a linux version??? I would seriously consider buying the device, but after all my searches, the less equipped xp version it the only one for sale. Gimme a link to someone who actually shows and sells (in the US) the linux version.